Spaniards are quite fond of their daily merienda, an afternoon snack during which many people stop at their local pastry shop for a sweet and a coffee to brighten up their day. You'll notice that lots of traditional Spanish desserts are filled with rich, creamy custard. 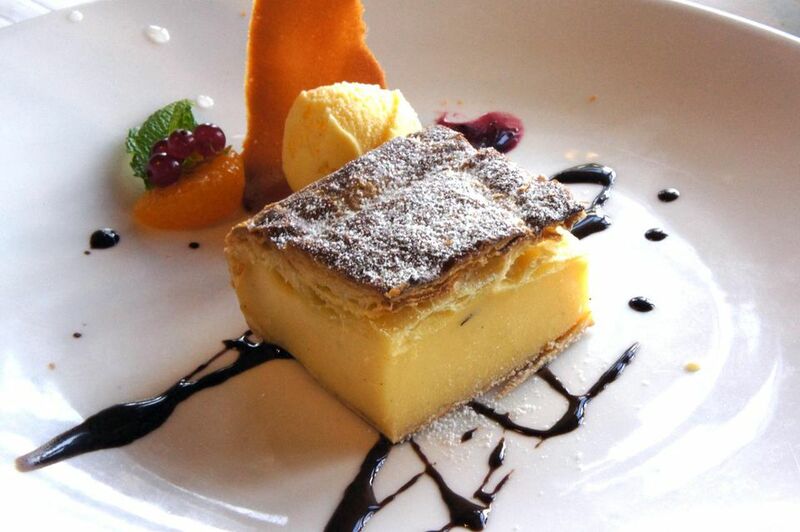 This Spanish-style egg custard (also known as Spanish pastry cream) is often flavored with citrus (lemon or orange mainly), and occasionally cinnamon. It is the most common filling (along with chocolate) in the popular napolitana pastry, which is a very popular pastry throughout Spain. As you pass the colorful pastelerias (pastry shops) in Spain, you will see beautiful cakes and pastries in the window displays, many of which have this rich Spanish style egg custard hidden between the cake layers, or inside the flakey pastry dough. Cooks at home also use this thick and easy egg custard recipe to fill pastries like classic buñuelos or the Basque pantxineta tort. This traditional Spanish egg custard recipe is the perfect solution for almost any recipe that calls for pastry cream. Here it is aromatized with lemon zest, vanilla, and cinnamon, but you can really experiment with different flavors, depending on the pastry you are preparing. Place the yolks and the 1/2 cup of sugar in medium saucepan and lightly whisk together. Using a wooden spoon, continue stirring and add the flour. Set aside. In a medium saucepan, pour the milk, vanilla extract, and grated lemon rind. Add a whole cinnamon stick and bring to a boil. Remove from heat and strain the hot milk mixture gradually into the pan with the egg and sugar mixture, removing the cinnamon stick and stirring constantly while you pour. Place the pan on the stove and heat to a simmer, careful not to boil. Stir constantly for about 5 minutes. Remove the custard from the heat and allow it to cool for a few minutes. As the custard cools, stir it occasionally to prevent a skin from forming on top. Once cooled to room temperature, chill in refrigerator until ready to use.